A little experiment is under way with a new Facebook page for RCIA catechists, candidates, inquirers, seekers in Glasgow. Just a place to share experiences and good practice. Click here or search 'Glasgow RCIA' on Facebook to check it out. To be baptised, confirmed and come to share in the Eucharist is possible at any age! Today, men and women from a variety of backgrounds are responding to the call to follow Christ and celebrate the Sacraments of the Church. Before sharing in the sacramental life of the Church, you will embark on a journey where you will get to know Christ better and deepen your relationship with him, which could change your life forever. On the journey, you will meet people who are seeking Christ in their lives, like yourself, and finding the way to answer his call. You will meet other Christians who are witnessing to their faith, to the teachings of Christ and his Church. The whole parish community journeys with you and supports you with prayer as you prepare to be welcomed into the worshipping community. In the Archdiocese of Glasgow, there are 96 Catholic parishes. Those who are interested in becoming Catholic should, in the first instance, make contact with their local Parish Priest. Every parish should have a programme for adults who are interested in becoming Catholic, called the Rite of Christian Initiation of Adults (RCIA). The starting point for becoming a member of the Catholic Church is simply talking to your local Parish Priest, who will be happy to talk you through the process. He should be able to listen to you and understand what God seems to be doing in your life. The Parish Priest can then introduce you to the basic steps towards becoming Catholic. The Church is the sign and instrument of the communion of God with His people. Membership of the Church comes through Faith and Baptism. All are invited to come forward to become Catholics. If you would like more information about Catholic Churches in your area, please click here. The Rite of Christian Initiation of Adults (RCIA) is the journey by which Adults are received into the Catholic Church. The journey is marked with celebrations throughout to sustain and support the seekers in their desire to share in the sacramental life of the Church. Beginning with a period of inquiry, the seeker has time to ask questions and find out where God is calling in their lives. This leads to the Rite of Acceptance when those seeking baptism are formally accepted by the Church and the community as catechumens. A period of formation follows in the parish community where the deepening of faith continues with the help of priests and people who accompany the catechumens and candidates (those already baptised and seeking full communion with the Catholic Church). Prior to the First Sunday of Lent, the catechumens and candidates, together with their sponsors and those who are accompanying them on the journey of faith, are invited to participate in a day of retreat. 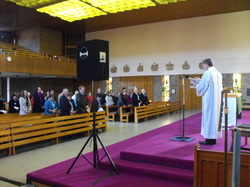 This took place at Our Lady of Consolation Church in Govanhill on Saturday 9th February. It was the first time that those candidates and catechumens assembled together in the same place as a Diocesan community. About 150 people in total. Having come from their parish communities and small groups (5 or 6 people) of formation, it was a daunting experience to be gathered in such a large crowd. The day offered the opportunity for participants to pray, to share their experience and to enhance their journey in preparation for the Rite of Election and indeed, their Christian Initiation. I thought I'd add a little about my journey, in the hope that someone else in a similar position might know that being almost housebound, does not prevent you becoming Catholic. Having a strong faith in God all my life and being drawn towards the Catholic faith on several occasions (although I never made enquiries), I found a great desire to convert to the faith at the age of fifty three. By this time, through severe disability, I was almost housebound and had no idea how to (or indeed if I could) set the wheels in motion. A good friend ( a faithful Catholic) I met over the Internet, suggested I ring the church and gave me a telephone number. I was visited by Fr David and spoke of my faith and reasons for converting, and about my private situation. And so began my journey, almost 15 months ago. I had to seek annulment of my first marriage and all paperwork was duly signed. I was treated with much respect and given special seating at my Tribunal interview, which I very much appreciated. As that process was taking place, I began my RCIA studies at home. Fr David arranged for me to have weekly home visits for this, which took place every Wednesday, after introducing me to Rachel who would guide me. I'm unable to sit on the church pews, as my spine cannot support me for any length of time, so I attended Mass over the Internet daily, had my weekly visits with Rachel, Fr David and later Fr Neil visited regularly. I found this journey so rewarding and learned so very much about not only the Catholic faith and God's word, but also about just how welcoming and warm Catholics are and how far they are willing to go, for someone in my position. I must admit, at times, getting impatient at having to wait for the result of my annulment, in order for me to reach my one and only goal. As I look back now though, I see it was yet another of God's blessings. That wait only served to increase my hunger for the Sacraments. The annulment was granted on June 10th this year, after almost fifteen months and things moved so quickly after this. Fr Neil knew well how strong my desire was and worked so hard on my behalf. On June 28th my name was entered into the Book Of Catechumens. 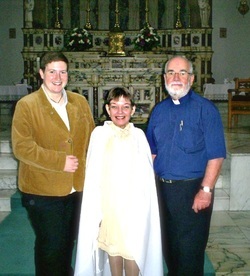 Fr Neil and Rachel (whom I'd asked to be my sponsor) both visited me for this to take place. Over the following 3 weeks, I had visits from 3 of the RCIA studies group (Enda, Rosina and John). One week we discussed Baptism, the next, Confrimation and the third Holy Communion. Fr Neil and I discussed the option of me recieving the Sacraments at home, or whether I'd be up to attending church. I decided that, despite pain or discomfort, I should be in God's house to recieve His glorious blessings. The week before Baptism, I had a short rehearsal in Holy Cross, which I found very moving. On July 28th, 2011, my longed for day arrived. I knew I was going to be emotional and indeed I was. I was Baptised, Confirmed and received Holy Communion along with another lovely lady named Helen. Fr Neil had brought Helen out to meet me just before our rehearsal. The atmosphere and love in Holy Cross that day was almost tangible. I felt I was finally coming home and the welcome I recieved was truly amazing. For so long, I had watched others recieve the Body and Blood of Christ and had such a longing to do so. Words can never convey the emotion in me, as I recieved Our Lord. We then had a lovely tea, provided by the church, where many parishoners came through to welcome us. We were surrounded by love and good wishes. I'm now where I know God wants me to be and I only pray I'm worthy of His love and gifts. I would like to thank every single person I've met on my journey Fr Neil, Fr David, Fr Anthony, Rachel, Edna, Rosina and John. I'd also like to thank those I've never met, but who worked so hard for me (especially the Scottish National Tribunal Glasgow and the Court Of Appeal, Birmingham). Special thanks my Internet friend Em, from London, who set me off on the right path and walked with me all the way. I'm proud to be a member of Holy Cross Parish. May God bless each of my newfound brothers and sisters. “God called me very suddenly. I was amazed. I didn’t realise that it could happen so suddenly and definitely and I quickly realised that I wanted to serve him as well as I could. Through the RCIA, I have learned to act upon my faith which gets stronger every day. I can sit and talk to my RCIA group about anything and feel I have had a lot lifted from my shoulders. I can pray at anytime, day or night. I talk to God normally, because He is my Father and I know he understands me. I can’t describe how I feel now. It’s like God has taken me over and at last I am on the right road. I will be with him all my days on earth and for all eternity. I can’t thank the RCIA group enough for helping me to realise that I HAVE taken the right path. I know there are a lot of people praying for me which fills my heart with happiness." “The moment Father Campbell baptised me, I felt the Holy Spirit entering me from the top of my head to the bottom of my toes. The feeling was so emotional I wanted to cry. Every part of the Easter Vigil made my heart swell as though it was about to burst. I know Jesus accepted me as I accepted him, before I was baptised, but I feel now that I am truly one of his disciples. I was a bit down for about a week after the Easter Vigil, but I have realised that I was on such a high after the months leading up to it. Although that didn’t last long, having realised that God is with me and helping me through those difficult times. I just want to carry on doing his work from now until the day I die, when I will be with him for all eternity! "For many years I was interested in becoming Catholic. I would attend Mass with family and friends. Quite often they would ask: “Why not become a Catholic?” But at that time in my life, it was easier doing nothing. Many years later I was no longer living in Glasgow and being away from family and friends, I found myself praying for them and indeed myself. During this period of prayer and mediation I found true peace in my life. I found this was God. A few days after my return to live in Glasgow, through a family member, I was introduced to Fr. Donnachie, parish priest at Holy Cross, who introduced me to the RCIA and the support given to people enquiring about the Catholic Church. The parish RCIA group meet every Wednesday and I felt that within minutes I was at ease in their company. The meetings became a great source of spiritual benefit and with an introduction to the Holy Trinity, I experienced an awakening to the Holy Spirit who I believe had guided me to become a catechumen. Every Wednesday, a new and wonderful experience was granted to me and with the help of the RCIA team and the parish clergy, it was always a peaceful and enlightening experience. The recent retreat day at Our Lady of Consolation for all the Catechumens, Candidates, Godparents and Sponsors was a wonderful day with plenty of fun and meeting other people going through the same journey was inspirational. There were workshops and open discussions on all our hopes and thoughts. The retreat also helped us to prepare for what was to come. Having celebrated the rite of sending to the Cathedral for the rite of election at Holy Cross, we made our way to the Cathedral and were made very welcome. The Rite of Election was a very peaceful and spiritual celebration which will be memorable in my heart forever. It was another step on the journey to becoming a member of the Church. I am grateful to the parish community and particularly the RCIA team and my Aunt Mary (godmother) for all their guidance and prayers." "Easter is early this year and the Vigil begins with the lighting of the new Easter Candle followed by a candle lit procession into the darkness of the Church. Suddenly, new light and as if new life has come into the Church with the beautiful flowers and a real serene feeling. When the celebration began, I tried to relax and enjoy the night. As Fr. Donnachie baptised and confirmed me, I felt humble and very grateful of God’s great love. When I received the Eucharist for the first time, I felt the seal of acceptance and commitment in joining the Lord’s wonderful community. At the end of our RCIA meetings we had a great wee party and another retreat day when we met up again with all the other people who had been received into the Church from all over the Archdiocese. It was a marvellous day full of prayer, fun and laughter. Archbishop Conti invited us all along to celebrate the Feast of Pentecost which was a very spiritual day and a lovely lunch followed. Barton, who guided and directed us throughout the year. Margaret gave of her time willingly and was always there for us if we required assistance or instruction. I will be forever in her debt. Following the Easter celebration, we were invited to celebrate the Solemnity of Pentecost with our Archbishop, Mario Conti. It was a wonderful ceremony and whilst the Archbishop was giving out communion, my 7 year old who was at my side commented loudly that the pope was waving to him. I had to clarify this later, that indeed it was the Archbishop and that he was giving him a blessing !!. There followed a buffet in the Cathedral Square and the sun shone brightly for all those in attendance. A great time was had by all." Catechism of the Catholic Church, 1229. What is the process of the RCIA? This is a time of no fixed duration where the seeker or inquirer has the opportunity to be opened to the values of the Gospel and the beginning of the journey of faith. This is the first public step taken by the seeker and marks the beginning of the period of the catechumenate and acceptance of the seeker by the Church and indeed the worshipping community. During this period, the faith and growth of the catechumen is nurtured and strengthened. This is enhanced by celebrations of the Word of God and prayers of blessing. This rite is celebrated in the Cathedral every year of the First Sunday of Lent. For the first time, all those seeking initiation into the Church community from each parish in the Archdiocese come together. It is during this celebration that the catechumens and candidates are declared "elect" to receive and share in the sacramental life of the Church. During the season of Lent, the elect are called to deeper reflection and conversion in preparation for the celebration of the Sacraments at the Easter Vigil. This is helped by the celebration of "scrutinies" and presentations with the Creed and the Lord's Prayer. The Easter Vigil is the highlight of the Church's year, and it is normally at this celebration that the Christian Initiation of Adults take place. Those who have been elected are initiated into the Church by Baptism, Confirmation and Eucharist. The time following Christian Initation is a time of celebration for the newly baptised and initiated into the Church and also a time for them to adapt to their new role within the community of the Church. This stage in the journey is normally concluded with a diocesan celebration of the great feast of Pentecost.